Avec le soutien du Labex TransferS. 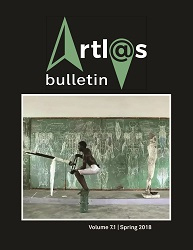 The ARTL@S Bulletin is a peer-reviewed, transdisciplinary journal devoted to spatial and transnational questions in the history of the arts. The journal promises to never separate methodology and history, and to support innovative research and new methodologies. Its ambition is twofold : 1. a focus on the “transnational” as constituted by exchange between the local and the global or between the national and the international, and 2. an openness to innovation in research methods, particularly the quantitative possibilities offered by digital mapping and data visualization. By encouraging scholars to continuously shift the scope of their analysis from the national to the transnational, ARTL@S Bulletin intends to contribute to the collective project of a global history of the arts. Since 2012, ARTL@S BULLETIN (ISSN 2264‐2668) is published biannually by the École normale supérieure, 45, rue d’Ulm, 75005 Paris, France and the Centre national pour la recherche scientifique 16, rue Pierre et Marie Curie, 75005 Paris, France. 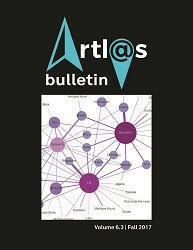 The online version of the ARTL@S Bulletin is hosted by Purdue Scholarly Publishing Service. Direction de la publication : Catherine Dossin (Purdue University), Béatrice Joyeux-Prunel (ENS-IHMC). Comité éditorial : Michela Passini (CNRS-IHMC), Daniel Quiles (School of the Art Institute of Chicago), Blaise Wilfert-Portal (ENS-IHMC).